Make the most of your trip to the South Shore with getaway packages from our local hotels or bed and breakfasts. Your choices range from romantic getaways to family adventures and entertainment deals. Book the Romance Package to receive in-room sparkling wine (where permitted by law) or cider upon arrival and full breakfast for two in their restaurant. Ready to say I do all over again? 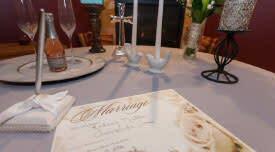 Let Serenity Springs help you make your vow renewal special. This premium package includes an officiant, nosegay, champagne, champagne flutes, photo, certificate and other romantic extras. Add to any stay for an additional $200 plus tax. To make reservations, call Serenity Springs at 219-861-0000. The package includes the "Full Service Stay" - bathrobe and massage therapy for each, carriage ride, fresh floral arrangement, bottle of champagne, shrimp appetizer, silk rose petals, chocolates and much more! $739 plus tax weekdays, $799 plus tax weekends mixer (Thurs-Fri. Sat), $849 plus tax weekends. Rates may be higher for premium nights and are based on two nights. Show that someone special how much you care. 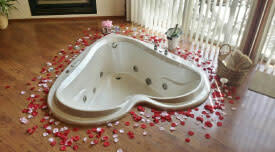 Package includes a bottle of champagne, gourmet chocolates, bubble bath, candles, silk rose petals and more romantic surprises! 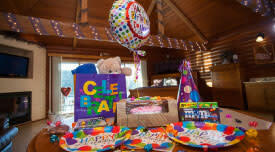 Find everything you need for a private birthday celebration including birthday cake, birthday hat, chocolate turtle, balloon and a gift bag with surprise gifts. 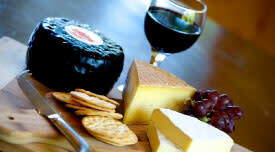 Relax and unwind while enjoying this popular package including a 12-inch platter stacked high with meat, cheese, fresh fruit and chocolates plus a bottle of wine (red or white). 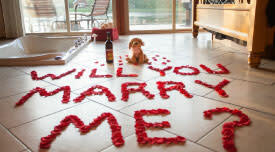 Serenity Springs is there to assist with their ideas or yours to carry out the perfect proposal. This premium package includes dinner for two (select menu), bottle of wine, proposal gifts, plus other romantic extras. Add to any stay for an additional $125 plus tax. Book a weekend and receive a $10 credit to spend in their on-property retail shops, late check-out at 2pm (where available), free internet access and hot breakfast.